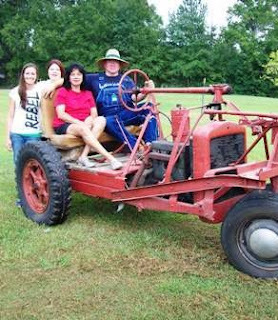 This past weekend, the family packed up our camping supplies and tied down the tractors and heading to Rick and Joann Minter's farm in the little community of Inman, Georgia. This is a show we have made a must do in our tractor show tour every year. It's a great three day show that we love! Tammy, Stephanie, Joann and Rick Minter. Yes, the truck runs! There are really cool exhibits all over the show grounds! All week before the show, Knox couldn't stop talking about getting to help with the printing press! This is a working printing press. There are three presses on the show grounds. They use them to print a really cool picture of Rick on his tractor drawn by a cartoonist into a coloring sheet and fliers for the show. Knox had the best time! The wheel he is leaning on is what he turns to print what is in the press. The press can be run by an electric motor too, but don't tell Knox! He was at or on another tractor! He had a blast! The tractors were no match for this toddler!! Our International Harvester Collector Club, Georgia Chapter #29, uses the Inman Farm Show as our state show. The Chapter puts up a tent and sells all sorts of IH items to raise money for our chapter projects. The tent is where the chapter meeting is held and where most of members meet to catch up with each other. This year someone set up a display of their toy tractors. It was all I or Frances could do to keep Hamp from trying to get them down and play with them! These are not toy tractors that are meant to be played with. They're meant to be looked at! So a little hands had to stay away!! Hubby had to go more than once to the Blacksmith shop. It was a hot Georgia fall day (in the high 90s). These guys were sweating to say the least! But that didn't stop these guys! You'll have to come back tomorrow for some more fun stuff that we got to see and do! i know the boys had fun!!! Visiting from the Blog Hops! Stop by when you get the chance. I have a Meet Me Monday blog hop and a Wandering Wednesday blop hop and I would love if you could join in.